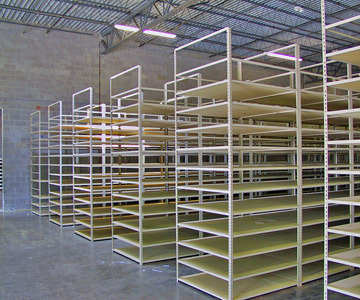 Shelving, Inc recently completed a high rise rivet shelving installation for a tier one automotive supplier located in metro Detroit area. 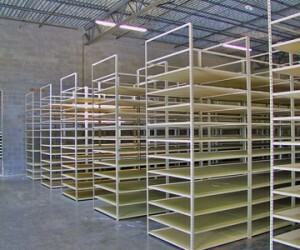 The client need larger shelves with the ability to have access from both sides of the units. The ceiling height is 16′ clear and the client wanted to utilize all of their valuable vertical space. Our team of professionally trained installers completed this project on time and without any interruption to our customers ongoing operations. We worked over the weekend to complete their project so our customer could begin loading the shelves first thing Monday morning. The weight capacity per shelf level is 300 pounds. If you have a shelving project that you need help with feel free to contact Shelving, Inc and we would be happy to have a representative provide a free evaluation, design and proposal.